I like to fly fish, but my husband loves it! So, when we travel for a fishing vacation, we need to pick the perfect location for BOTH of us. Truth is, he could escape on his own to any fishing lodge around the world, but being together and experiencing new places is important to us. The trick is to find a spot that balances being able to fish with a bit of luxury and a boutique hotel. 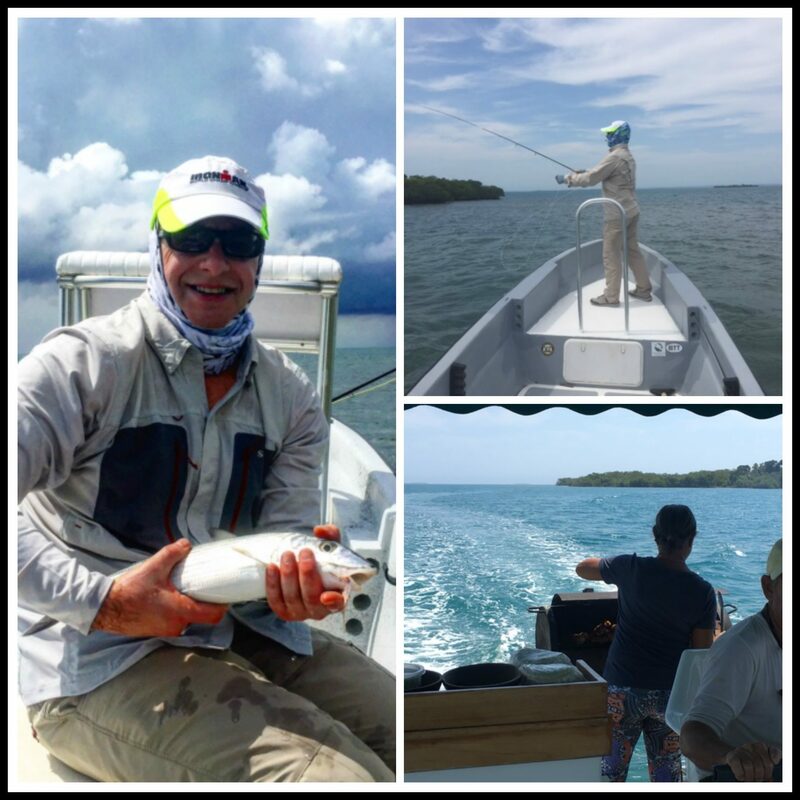 Our friends at Orvis were able to deliver recently when they sent us to Belcampo Belize. 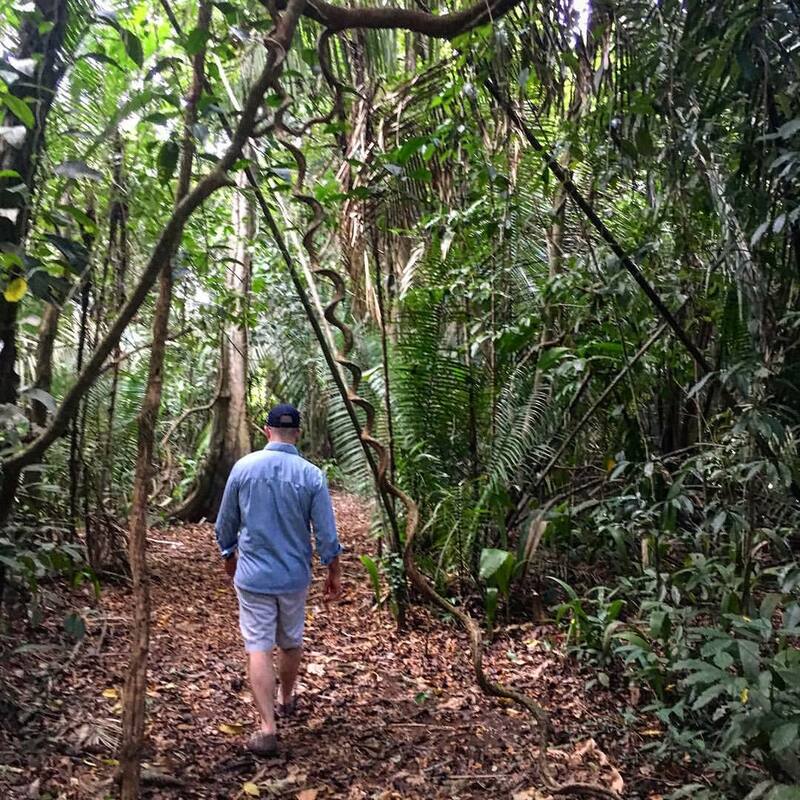 Hiking the trails at Belcampo Belize. Photo credit Dana Zucker, Luxe Traveling Mom. Belcampo Belize is a 17 room boutique resort located in Southern Belize. It is the best of a fishing lodge, agrotourism, ecotourism, luxury resort, fine dining, and spa. The lodge is situated along the Rio Grande River with a beautiful view of the Caribbean Sea. The property sits on a 12,000 acre nature preserve and has an organic farm and is just about completely sustainable. Well, that’s half the fun! Once you arrive at Belize City International and get through customs, you transfer to Tropic Air, which is sort of like the bus system in Belize. It is a beautiful flight that makes two or three quick hops down the coast before you arrive at Punta Gorda. There one of the fabulous staff of Belcampo is waiting to greet you in the Land Cruiser. A short 15 minute ride and you arrive in paradise. You are greeted by the staff, a refreshing ginger drink and personal water bottle in hand for you to use during your stay. 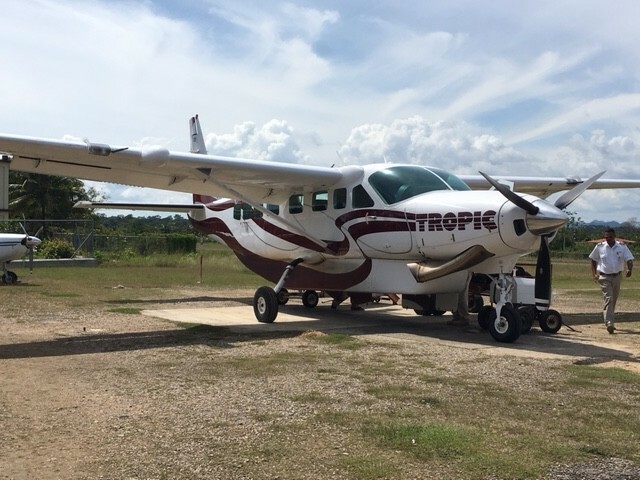 Our Tropic Air flight in Belize. Photo credit Luxe Traveling Mom. Although Belcampo has 12,000 acres, much of it is a nature preserve. The grounds include livestock areas, a farm, a new rum distillery being built, the chocolate and coffee building, acres and acres of sugar cane, vanilla and more, trails, and a dock on the Rio Grande. The lodge is at the top of the ridge and the spa, pool, restaurant and bar are right there. Beside the Lodge sits the Deluxe Suites and Jungle Suites. We had another short journey to get to our room. 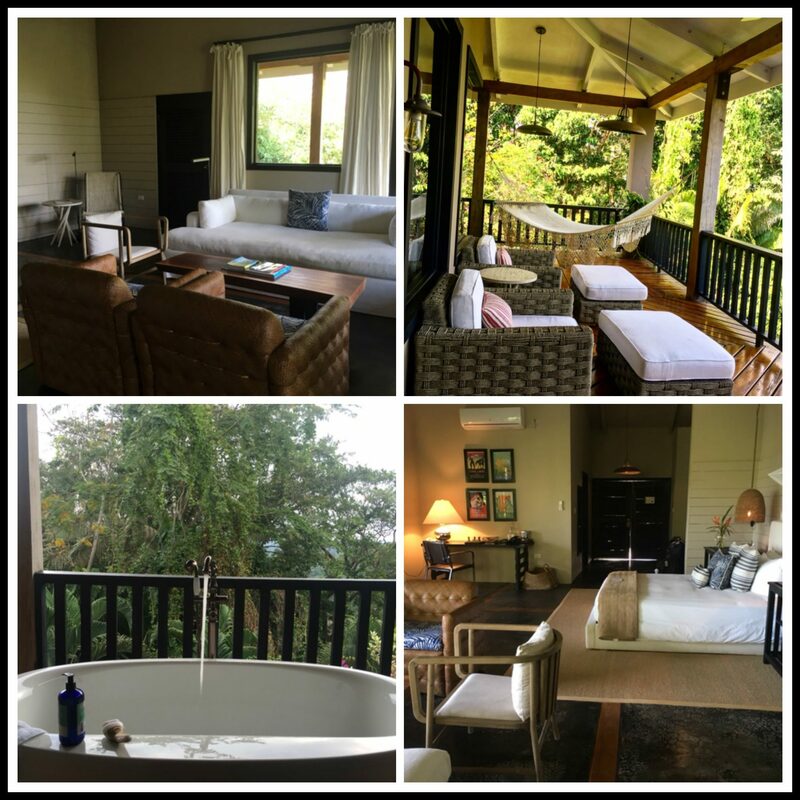 You can travel either by foot or by hill cable car to the very top of the ridge, where there are four private Ridge Suites. Each room type is different, but includes all you need. The decor is comfortable and beautiful. We spent a lot of time hanging out in our room, on our private balcony and in our outdoor tub. The room was very spacious and literally immaculate. Large windows allowed us to watch the many birds and howler monkeys all day. The Ridge Suites also have a center common area with an infinity pool, and a beautiful covered area to relax in. You can tell there was much thought put into the comfort of the furniture. All rooms have wifi, but no TV’s. We loved this, but it’s not for everyone. It allows us to truly relax and enjoy our time together and get away from the world for a bit. Our room at Belcampo Belize. Photo credit Dana Zucker, Luxe Traveling Mom. 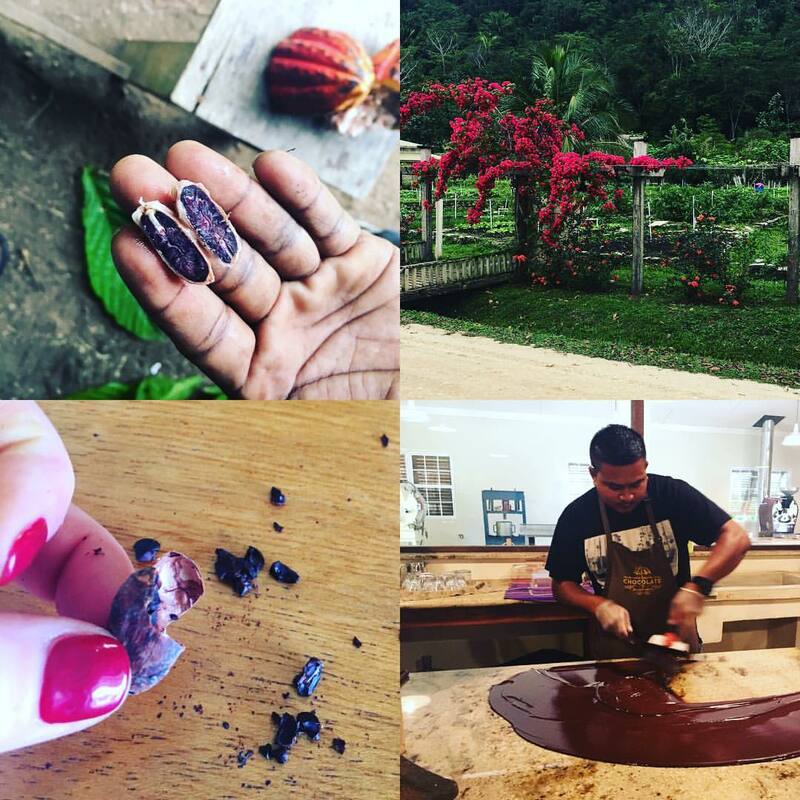 There is no shortage of things to do at Belcampo. Whether I was with hubby on his days off from fishing or alone, my needs, wants, and desires were met be the efficient and courteous staff. One of the days hubby was fishing, I scheduled a trip to the market with one of the guides. What was to be an hour and a half trip to the market turned into three hours after we spotted a toucan and stopped the Land Cruiser to follow it into the jungle by foot. It was so exciting! Touring the grounds of Belcampo Belize. Photo credit Dana Zucker, Luxe Traveling Mom. 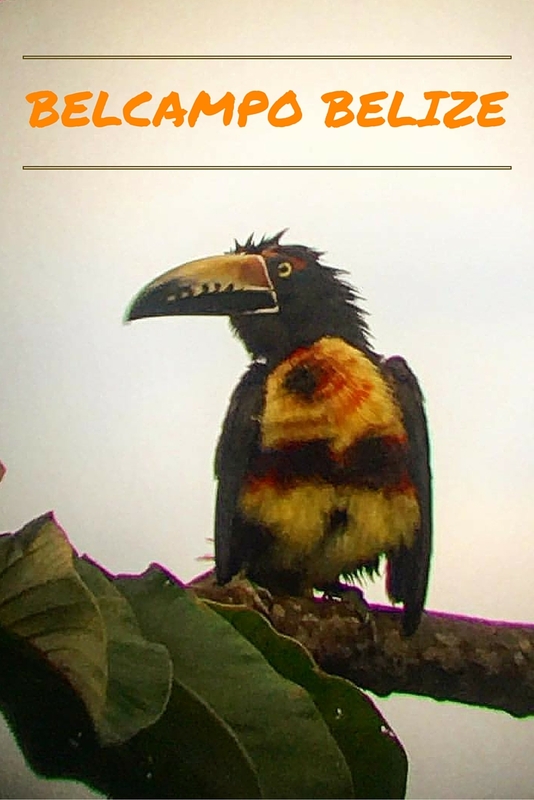 We took the long way home to check one other area and found two more toucans. From doing nothing to hiking to treatments at the spa to snorkeling with the chef to a sunset cruise to a trip to the ruins or local cave to swim, there is no shortage of activities. If you bring the kids, there is plenty for them to do, too. I cannot say enough about the food! Almost all of the food, including the vegetables, pork, chicken, and lamb, come right from property. The goal is to be sustainable. Chef Renee prepares clean food and allows the flavors to shine through. The ingredients are organic and prepared with local flavors. From the fresh fruit on the breakfast table each morning to dessert after dinner, not one detail is missed. 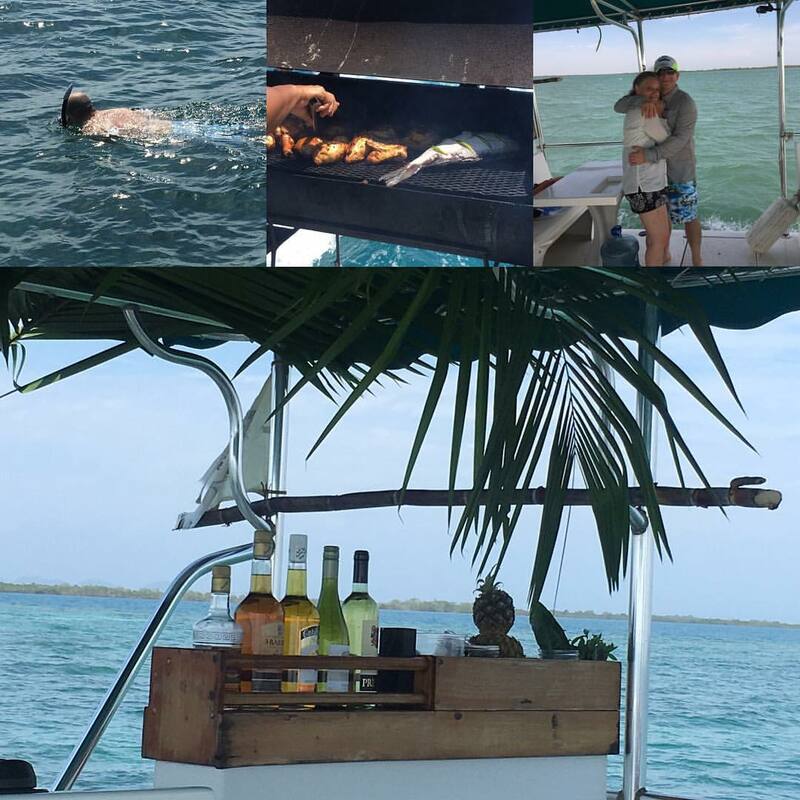 We also spent a day on the water with chef diving for our lunch, which she proceeded to prepare right there on the boat, using both a ceviche method and the grill. What made me happiest on the whole trip was when my husband told me it was the best food ever; that it reminded him of how I cook, just with different flavors. More about chef and the food to come soon. Enjoying eating what we caught at Belcampo Belize. Photo credit Dana Zucker, Luxe Traveling Mom. World Class is the only way to describe the fishing experience. Belcampo packs you a fresh lunch each day and you depart in the Land Cruiser to head to the marina to meet your guide. This is the Permit capital of the world, but both Tarpon and BoneFish are sought after, too. 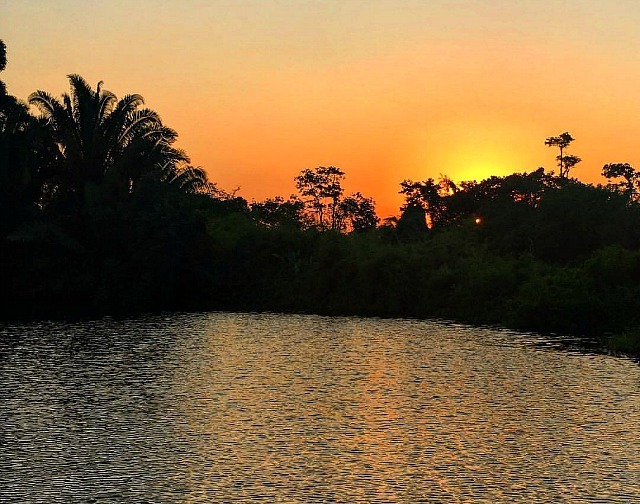 The Belize government has high environmental standards and are working hard to preserve the land and waters, so it is a catch and release fishing for those three. The fishing is on the reef, in lagoons, up rivers, and around islands. My husband loved every minute, but due to the weather, a bit too choppy for me, I didn’t fish this year. Next year, I will try again to do a half day. I just have to get double haul practice before than. Fishing at Belcampo Belize. Photo credit Dana Zucker, Luxe Traveling Mom. There’s really not much to say here. They were truly THE BEST we have experienced anywhere around the world and we have been to top resorts. No lie. They met every need and whim we had. Period! The suites start at $380 a night and a Ridge Suite is $510 this year. In our estimate, it was worth every penny. There are many packages available as well. 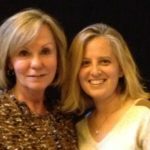 I highly recommend talking to Orvis or Belcampo to determine the best package for your stay. We chose a fishing package that included seven nights and six days of fishing and then added on three additional days. All of our food was included. We paid separately for alcoholic drinks, wine, and activities other than fishing. The staff was so amazing we also tipped many of them additionally. Book at least a five night stay. Take a day off from fishing in the middle, if fishing for six days is in the plan. Take advantage of all there is to do on the grounds. Book your trip for next year before you leave.